Govt investigation proves RAB responsible for Extra Judicial Killings - Arif died from torture, Bappi from direct firing! By Arif Alauddin, Two incidents of extra judicial killing by RAB (Rapid Action Battalion) have been proved in a recent investigation conducted by the Home Ministry itself. In one case, Mohiuddin Alamgir of Mirpur died from inhuman torture while in the other, young model Bappi of Rampura was killed - not in a crossfire, but from a direct bullet fired by the RAB. In the last week of January of this year, Md Mohiuddin Arif was arrested by members of RAB - 4 from Pallabi in Mirpur, as a suspect in an under investigation case. According to Home Ministry Investigating Committee, an analysis of available evidences clearly showed that the RAB and Police kept Mohiuddin in their custody for long 46 hours in breach of the law, and mercilessly tortured him. He died as a result of these physical tortures. Police also tortured him at the Pallabi Police Station. The Investigating Committee recommended that the persons connected with the killing of Mohiuddin Arif should be brought under legal action. In another incident occurring on 9 October 2009, a young model and actor Kaiser Mahmud Bappi was shot and killed by RAB-1 members without any evidence of crime by him. The wrong information regarding the presence of top terrorist of East Rampura, Kamaruzzaman Bappi alias Mian Bhai alias Bappi and his associates was given to the RAB force by its source and RAB – 1, without verifying the truth of the information so provided, conducted the operation. These were not right, the committee said. It also said that in this case, the RAB officer who led the operation, failed to prove his efficiency and wisdom. Terrorist Bappi and dead Bappi were not the same person. The Investigating Committee recommended that it was important to bring both the secret information providing source, and the officer who gave leadership to the operation, under the law. Following complaints made by the National Human Rights Commission, Asian Human Rights Commission, Bangladesh Institute of Human Rights and family members of the dead, the two reports of the Investigation Committee are being sent, under the leadership of Deputy Secretary, Law Division of the Home Ministry, to the National Human Rights Commission via a higher official of RAB. Smritirani Gharami, Deputy Secretary of Home Ministry was the Chief of both the Investigating Committees while DC, Dhaka Metropolitan Police, Ramna Zone and Advocates Adilur Rahman and Shamsul Hoque – both human rights activists, were members of the committee. Last month the both the reports were submitted to Secretary of the Home Ministry. The complete report of the Investigating Committee is attached at the end of this report. The requirement of human rights awareness, deep-investigative mentality and rapt attention are necessary for conducting investigation of such tragic incidents of extra judicial killings have been reflected in this report. A detail picture of how RAB and police in the name of arrest harass people and conduct inhuman torture on them, and crush the Constitutional and legal rights of the citizens at every step, has been vividly reproduced in these two reports. The Committee in its report recommended that to avoid the occurrence of pathetic incidents, it is essential to ensure the appointment of such officers of the Law and Order Force who have long experiences on the job as leaders. In addition, the Controlling Authority should be aware that no RAB, working at the field level, can ever engage in extra judicial behavior and/or activity. Secondly, the act of taking citizens into custody by plain-clothed unarmed RAB members performing detective-duty, for the purpose of questioning, must be stopped. Thirdly, in every case, the laid-down process of questioning of a person, arrested on the basis of any complaint, must be followed. The Investigative Committee also recommends the ensuring of good treatment of an accused or an under-trial prisoner by making available necessary medicines and medical equipments as and when required side by side with ensuring proper behavior of hospital and jail-authorities with the accused or an under-trial prisoner. Investigative Committee's firm realization is that in order to ensure peoples' confidence on RAB activities, side by side with adequate publicity of their actions, if any RAB-member causes any harm, illegal attack or hampers some constitutional rights of a citizen is any way, then the accused should be given exemplary punishment through legal means. The plain-clothed RAB-members who had arrested Mohiuddin are: Sergeant Biswanath Rai, Lance Naik Atikur Rahman and Constable Md Babul Akhtar. The report mentioned that the injury in the finger-nails of Md Mohiuddin was caused by a glass by Pallabi PS Officer Incharge Md Iqbal Hossain but the rest of the injury in his body, according to the statements of other two accused, was evidently caused by the RAB. The Medical Officer put the cause of death in the post mortem report as - "(In my opinion, the cause of death was) due to shock resulting from above-mentioned injuries which were ante-mortem and homicidal in nature and caused by a blunt weapon." The RAB members in their statements said during the arrest as accused Mohiuddin Arif tried to flee, he fell down on the pitch road in the ensuing scuffle with RAB members as they tried to catch him and badly wound his knee. But according to the doctor, in Arif's body the open wound was not only in his knee. There were wounds caused from rubbing on the front side of both his legs below the knees covering an area of 10''X 0.5''-1''. The Investigating Committee questions the possibility of such big wounds caused from falling down on the pitch road as a result of scuffle with RAB members. It may be mentioned that the incident of extra judicial killing of Arif was proved in the primary investigation of the Asian Human Rights Commission. Compared to the past, incidents of extra judicial killing have marked a rise in recent times. On the other hand, the killing operation of Kaiser Mahmud Bappi comprised RAB-1 ASP Sarkar Omar Faruk, Sergeant Md Abdul Hannan, Lance Corporal Md Azam Khan, soldier Pikul Biswas, Sergeant Md Kazimuddin, ASI Khan Maruful Islam, ASI Md Rokunuddin, Corporal Md Khasru Mian, and Naik Md Mizanur Rahman. According to RAB's statement: "As soon as RAB force reached the crime spot, following the receipt of secret information and order of higher authority, the terrorists suddenly started to spray bullets at them. These bullets hit ASI Rokunuddin on his right leg and seriously injured him. The RAB members fired back at them to save their lives, safeguard government property and rescue illegal arms and ammunition. After about 20 minutes shoot-out, one of the terrorists was hit by a bullet fired from one of his armed associate terrorist's gun and died on the spot. There are cases filed against terrorist Bappi in various police stations. Terrorist Masud Mian was caught with one locally-made one barrel gun and one cartridge while accused Abid Hasan was caught with three cartridges from the crime spot. Dead Bappi had one locally made revolver in his right hand." According to the Investigating Committee, no evidence was found to substantiate RAB's claim that there were cases lodged in different police stations against dead Kaiser Mahmud Bappi. Although Bappi was a phensidyl-addict youth, RAB failed to prove any evidence that he was a terrorist. Besides, the investigation also could not come up with any evidence of the presence of armed terorists at the crime-spot as claimed by RAB-members. The report stated that it was evident from the situation that Bappi was killed by the bullets fired by the RAB (ie not in a cross-fire) alone. Just as the over-excited initiative of the source was responsible for the sad incident so was the RAB officer's lack of alertness. When Bappi gave his identity as belonging to a decent family, had the RAB stopped firing then, may be Bappi's life would have been spared. Besides, the Investigating Committee report while stating that the claim of injury of RAB-member by terrorist's bullet did not support the doctor's prescription, said, the contradicting statements give rise to a third belief that as per the belief of Bappi's family that despite the statements of RAB saying that a huge round of bullets were sprayed if no RAB member was injured, it would create doubts in the minds of the mass people. Due to this reason, after a RAB member accidentally hit construction materials at the under-construction building and received lacerated injury on the leg heel they tried to pass it on as a bullet wound. During the period of January – September 2010, 90 people were reportedly killed extra-judicially. It has been further alleged that of these people, 40 were killed by RAB, 33 by Police, 08 persons were killed by the joint operation of RAB and police, 03 were killed by the RAB- Coast guard jointly, 05 persons were killed by the operations of RAB- Police- Coast guard and 01 person was killed by BDR. On September 5, 2010, the newly appointed Director General of Rapid Action Battalion (RAB) Mokhlesur Rahman said, "RAB never supports extrajudicial killings. RAB is not involved with these incidents and RAB will operate its duty upholding the human rights." Abdur Rashid (60), Rajshahi divisional commander of Purba Banglar Communist Party (Led Flag) was killed by RAB at Sathia in Pabna on the same day when the DG RAB has given statement to the journalists. Looking back to the records of government's statement on crossfire, one finds that on March 28, 2010, Home Minister Sahara Khatun said, "RAB members are left with no option but to open fire when criminals shoot at them." On May 28, 2010, Law Minister Shafique Ahmed claimed that crossfire killings have stopped. 'No more crossfire incidents are taking place in the country. It has stopped'. On July 8, 2010, he further said, "Action will be taken against the perpetrators if any further incident of extrajudicial killing occurs." 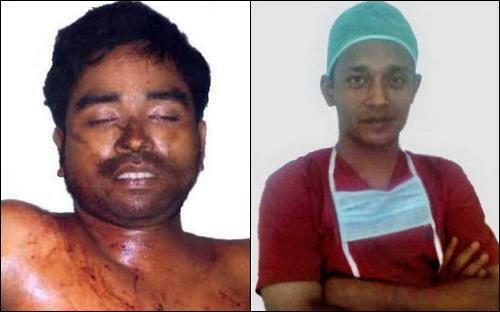 It should be noted that following the crossfire killings of two brothers Lutfor Khalashi and Khairul Khalashi from Madaripur on November 15, 2009, a bench of the High Court Division, consisting of Justice A F M Abdur Rahman and Justice Imdadul Huq Azad, issued a suo motu Rule on the Government. The High Court Division asked the Government as to why the High Court Division should not declare the crossfire killings of the two brothers illegal. When the Government prayed for time on the date of hearing on December 14, 2009, the Bench issued a direction to stop crossfire killings until the Rule was disposed of. Later on when the Chief Justice reconstituted the concerned Bench, the hearing of the Rule issued did not happen. In the early morning on July 1, 2010, a businessman named Mizanur Rahman died in police custody at Gulshan Police Station. Taslima Begum, his wife, alleged that police picked up Mizanur Rahman on June 29, 2010 from the Nayanagar area in Baridhara in the city. After that, police demanded Taka one hundred thousand from her. Police allegedly shot and killed her husband upon failure to realise that money. On July 3, 2010, some plain-clothes police of the Darus Salam Police Station at Mirpur allegedly picked up one person named Mojibar. His body was recovered from the Turag river the next day. It has been learnt that Mojibar's 7-year old son Iqbal was with him when Mojibar was picked up and beaten by police.